No idea on the frost – how about it requires a frost before it is harvested? All guesses but I think I got two right. Welcome and thanks for playing! Excellent work! My answers are coming on Wednesday. 2. 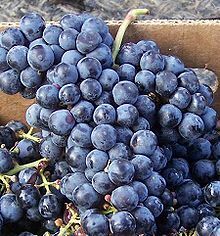 Hmm..all I can think of is that Cabernet Franc is a secure grape for Bordeaux wine makers in case of early frost that ruins the harvest of Cabernet Sauvignon. Thank you for the quizz. Red wine is fun! Excellent work! my answers are coming on Wednesday.